This Second Judicial District Court of the State of Nevada, County of Washoe jury trial in front of Judge Jerome M. Polaha began October 31, 2011. Case is now with the Jury and they will begin deliberations 8:30 am Monday November 21. Robin Listman, an avid boater, was on Pyramid Lake in Washoe County Nevada on August 18, 2001. She was out with her in-laws on their 19 foot Four Winns 1995 boat powered by a OMC Cobra stern drive. Robin was riding an air chair, a towed board on a foil that rises from the water at speed. A float toy belonging to her son blew into the water (later said to be a floating dinosaur that can be towed), the boat owner told her to get in and he would retrieve the floating toy. He drove to the floating toy, the wind blew it behind the boat, she stepped onto the swim platform to retrieve it, she reached for the toy and fell in, the owner put the boat in reverse, she was seriously injured by the propeller and lost a portion of her right leg. Below, we provide links to our coverage of the actual courtroom testimony and events, below that we provide a general discussion of the case. The actual courtroom coverage is on separate pages. November 14 we began blogging the trial daily via a Courtroom Video Network feed. We will begin coverage going both forward and backward in time. Links to our coverage in time sequence of the trial will be available below. Content below was written prior to us blogging the case. First filed in August of 2003, this propeller accident case involving OMC (Outboard Marine Corporation) has been around a while. Volvo Penta has also been mentioned in this case several times in the past due to OMC stern drives in that era being built in a joint venture with Volvo Penta in Tennessee. In July 2008, the same judge, Judge Jerome M. Polaha, in the same court, issued a summary judgement in favor of the defendants Outboard Marine Corporation. Judge Polaha said the court was left with the impression that although the case seemed viable, no real evidence was presented to demonstrate that facts were available to backup the plaintiff’s pleadings, especially not after five years of litigation to gather and present that evidence. The judge was particularly speaking to Robin Listman’s claims the boat was unsafe as manufactured, that commercially feasible alternatives were available at the time of production, and the plaintiff’s expert not completing testing of the device (alternative) he designed prior to his deposition in May 2008. A year later in August 2009 the summary judgement was vacated and a decision was made to allow the case to proceed to trial after the case was remanded to them by the State Supreme Court. It appears that decision was primarily made on the issue of testing prototypes. In initially considering the case, the local court strongly weighted problems with the development and testing of the prototype designed by Marshal Paulo, Listman’s propeller guard expert, which were focused on by defense attorneys. Later, the court recognized it focused on problems with the prototype and its testing at the expense of the real issue of proving an alternative safer design was feasible at the time of manufacture. The last time Listman v. OMC was tried, on 3 November 2010 (the first day the jury was seated) a mistrial was declared. As we understand it, the mistrial was due to Jay O’Sullivan, defense attorney for OMC, violating rulings the Court made on pretrial motions in his opening argument. In early 2011, OMC unsuccessfully argued the propeller accident took place on Native American lands, and therefore the court did not have jurisdiction. We anticipate a full blown trial exploring all the avenues open to attorneys on both sides. The Washoe jury trial will likely explore many elements covered in our Aspects of the Propeller Safety Debate Chart. Or at least the issues that have not yet been eliminated by pretrial motions from one side of the other. In the original trial, the defense strongly wielded the 1989 National Boating Safety Advisory Council (NBSAC) Subcommittee on Propeller Guards report. We suspect with some of our findings since then (see NBSC Propeller Guard Subcommittee Report 1989) they will be less likely to be swinging that around anymore. Our analysis shows the revolving door makeup of the subcommittee, how the report was constructed, and how one member was indicted for mail fraud and later pleading guilty for his part in tampering with a union vote during his time on the subcommittee following an investigation into allegations of embezzlement and rigging union elections. Our report also covers other events occurring in the background at that time, and follows up on what became of members of the Propeller Guard subcommittee. We would also anticipate seeing some “flip up” rear screen propeller guards of the nature of Guy Taylors Navigator 3PO propeller guard during the trial. 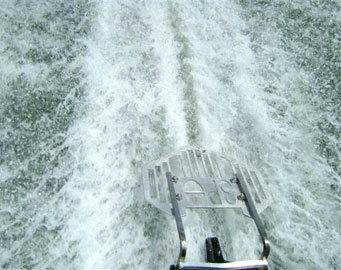 Rear screens that automatically flip up due to the drag force created as the flap moves through the water when underway greatly reduce drag, and provide great protection against strikes from the rear, like the Robin Listman accident. While Mr. Taylor’s guard is relatively new, the concept has been around at least since 1975 as shown on our The Flapper 13 October 2006 post on our Propeller Guard Technologies page. With a flip up rear screen guard being the exemplar in the Brochtrup trial and the Brochtrup accident having several similarities to this one, we would expect to see something of that nature here as well. Guy Taylor’s Navigator 3PO Propeller Guard’s flap (he calls it a shield) just skims along the surface and creates minimal drag. If OMC argues Guy Taylor’s “flip up” Navigator propeller guard is unsafe because it creates a larger cross sectional dangerous area than an open propeller or that it may impact boat handling, just show them this 1993 Japanese propeller guard patent and watch them wilt. 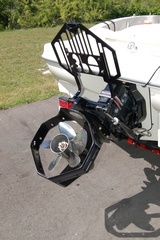 This “flip up” prop guard just skips along on top the water when you are going forward, then provides protection when at rest or in reverse. Some may spell Washoe County as Washo County. 95% of this would go away if you looked at the MPT nozzle system. Courtroom View Network (CVN) has full video coverage of the Listman v. OMC trial for legal professionals and others.